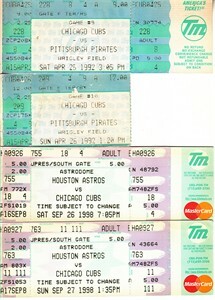 Chicago Cubs lot of 4 different stubs or tickets: 4/25/92 vs Pirates (full untorn ticket), 4/26/92 vs Pirates, 9/26/98 at Astros (full untorn ticket) and 9/27/98 (full untorn ticket). The two 1998 tickets are from Sammy Sosa's 66 HR season but he didn't homer in either. ONLY ONE LOT AVAILABLE FOR SALE.